Paryushan, the Jain festival of penance and forgiveness will begin in a few weeks. During the festival, followers of the Jain faith traditionally fast, repent, and forgive. For lay members, fasting often entails avoiding activities that are traditionally thought to cause more himsa than others, such as eating root vegetables or eating after sunset. 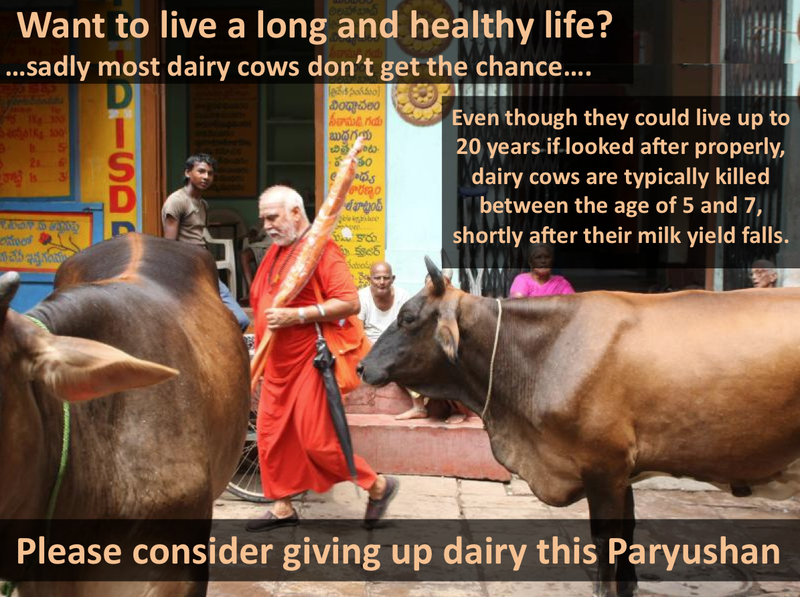 As someone who has come across the activities of the Jain Vegans Working Group, you will be aware of how our consumption of dairy leads to the immense suffering and killing of innocent cows. Dairy cows are forcefully impregnated by means of artificial insemination to stimulate milk production. Calves are immediately separated from their mothers at birth. Dairy cows will normally get killed before the age of 10, even though they could live up to 20 years if given the chance. This is because her milk yield drop, and it is not does not make financial sense for a farmer to keep her alive when he is able to obtain milk from her younger (and more productive) daughters. In light of this, it seems reasonable that during Paryushan we as Jains should acknowledge and reflect on the suffering we have imposed on cows as a result of our consumption of dairy products. Paryushan offers a perfect time to reflect on the actions we undertake in our daily lives and to make changes to our dietary habits. 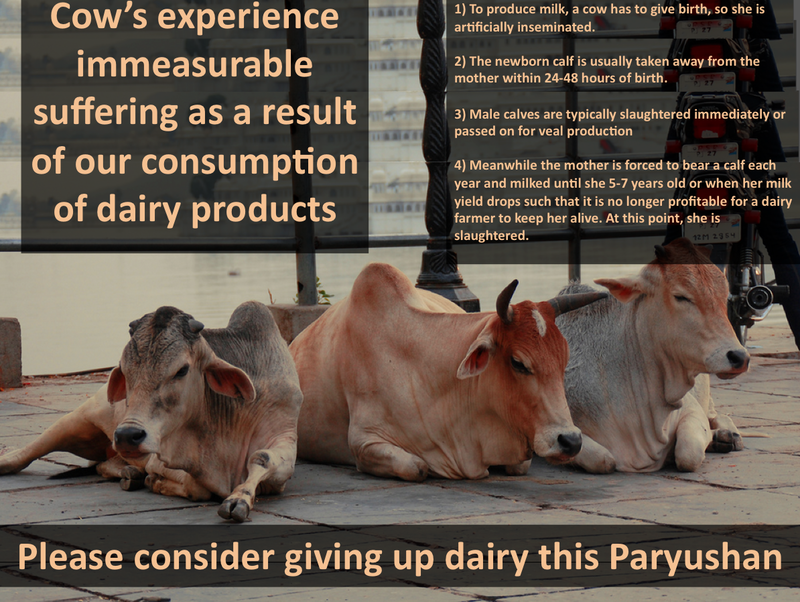 So, in addition to the other activities you undertake, why not consider giving up dairy products this Paryushan? 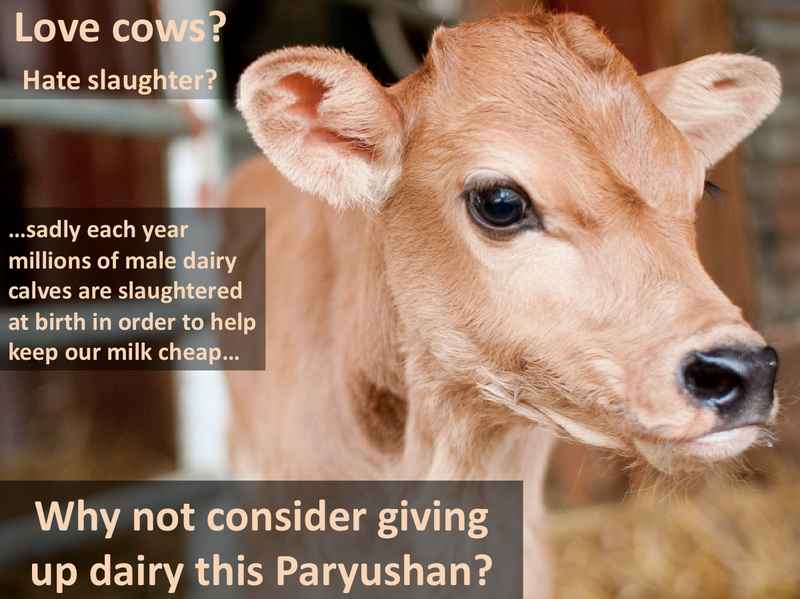 If you believe giving up dairy products this Paryushan is a good idea, please help spread the word. Kindly forward this email on to friends and family, or spread this weblink via Facebook orTwitter. Please let us know how you get along, and also consider making this image yourFacebook cover picture. This entry was posted in Paryushan, Uncategorized and tagged Paryushan. Bookmark the permalink.